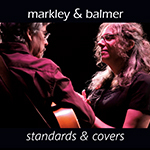 In their latest release, Standards & Covers, Markley & Balmer, famous for mixing jazz, folk, pop, bop, and the occasional polka, turn their considerable talents to jazz, and interpreting the works of others. Accomplished songwriters in their own right, both provide some lyrics for this album. Lisa Markley has transformed "Lennie's Pennies" into "Hundred in a Dollar," while Bruce Balmer changed "A Day in the Life of a Fool" into "One More Day". Their unique takes continue with Bruce's arrangement of "House of the Rising Sun." The Standards herein fall sweetly upon the ear - Markley & Balmer - voice & guitar - the songs shine through. 96kHz FLAC is the highest quality format available at our store. FLAC is a lossless format that is identical in quality to CD. MP3 is a compressed format that will work in any player. Soona MP3s are encoded at 320kbps.